Doctoral candidate Mason Burley defends his thesis on April 20, 2017. The treatment of people with serious mental illness has changed dramatically over the last 50 years, from long-term institutionalization to community-based care. But the community-care system is lacking, and some people with serious mental illness are repeatedly hospitalized, released and re-admitted, a costly and disruptive cycle. 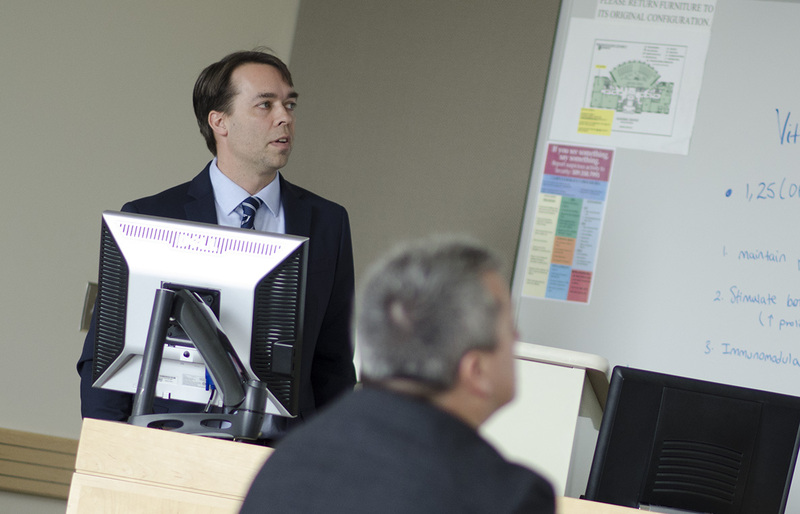 Washington State University doctoral student Mason Burley wanted to identify consistent and reliable factors associated with psychiatric re-hospitalization to help guide public policy and treatment options. Burley’s research used administrative data from 19 community hospitals in Washington and zeroed in on adults who were hospitalized for the first time for treatment of specific mental diseases and disorders such as schizophrenia, major depression and bipolar disorder. Then he tracked re-hospitalizations of that group over the next two years. The research identified some demographic, clinical and financial factors that predicted re-hospitalization – people being treated for schizophrenia, for example, had a higher risk of re-hospitalization, as did people enrolled in Medicare or Medicaid. His research is the first to examine risk factors associated with repeated hospitalizations among a statewide, all-payer population. In subsequent hospitalizations, the length of treatment had a small but significant association with reduced risk of re-hospitalization. Burley concluded it’s feasible to predict which patients are most likely to be re-hospitalized for psychiatric illnesses, a finding that could be used for early-intervention programs. He also suggested additional study on the appropriate length of stay for high-risk patients. Burley is enrolled in WSU’s Individual Interdisciplinary Doctoral Program, with course work in nursing, psychology and health policy and administration. His dissertation chair is Kenn Daratha, PhD, MBA, an associate professor in the College of Nursing.